Be sure to cook poultry thoroughly, the government tells us. This urgent warning came Friday from the U.S. Department of Agriculture after 32 people in 12 states got sick from salmonella after eating frozen chicken. The kicker: Each and every package was properly labeled “uncooked chicken” and did not include microwave cooking instructions. So those folks were winging it, so to speak. “(Food Safety and Inspection Services) is reminding consumers of the critical importance of following package cooking instructions for frozen, stuffed raw chicken products,” the warning said. It’s led to the predictable slew of near-hysterical media reports: “Latest warning highlights dangers of microwaving,” Netscape News cried. Pardon me if I sound callous, but to me the latest warning highlights the dangers of being dumb. 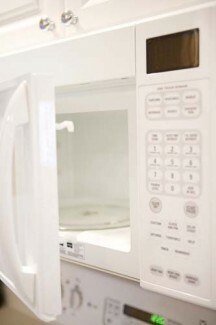 “The problem is that microwaves heat unevenly, and can leave cold spots in the food that harbor dangerous bacteria, such as E. coli, salmonella or listeria,” read The Associated Press article appearing on Netscape News. Yes, microwaves do heat unevenly. Which is why mine is pretty much an over-priced bun warmer, leftover reviver and coffee zapper. I know there are microwave recipes out there. I’ve even tried a few, but they’ve never worked for me. Maybe it’s because I expect the microwave to be quick and easy, when in reality it’s often more tedious than the stove. The recent hysteria was easy to whip up. There always have been rumors of dangers of microwave cooking. I knew a man now in his 70s who refused about 20 years ago to have a microwave in his home, fearing some sort of atomic-bomb-type sickness from it. His wife overruled him, and he eventually conceded the wisdom of the purchase. But not before days of complaining about microwave-induced stomach cramps. Then there was a study from Cambridge in 1994 that smacks of the same behavior that led to “caution! hot!” warnings on carry-out coffee. The conclusion: Too-hot microwaved food can burn the larynx. Guess the British haven’t heard of pizza mouth. I quit microwaving vegetables about five years ago, after a Journal of the Science of Food and Agriculture study found that nutrients fly off nuked broccoli faster than a Saint Bernard loses hair in July. Harvard disproved that theory about a year later. Turns out the original researchers used 10 tablespoons of water in their experiments, far more than most folks use. When you come right down to it, you don’t need any for frozen veggies. Later studies at Cornell University found that some foods — such as spinach — are more nutritious when nuked and others — such as bacon — have lower levels of cancer-causing agents, according to a New York Times article. And the U.S. government says microwaves are safe. Not that a proclamation from the Foot-Dragging Administration reassures me. It took years, not to mention an expose by the Orange County Register and government intervention from those crazy Californians, before the feds got the lead out on getting the lead out of Mexican candy. On allergy labeling, we’re still dinking around with task forces while Canada’s moving ahead. At least things aren’t as dire here as in Australia. In July 2007, the government there issued a warning about microwaving diapers after a baby was hospitalized for burns from a nuked nappie. That’s good enough reason to switch to disposables.